Rabbi Black became Senior Rabbi of Denver’s Temple Emanuel in July 2010, just before Abq Jew came to town. 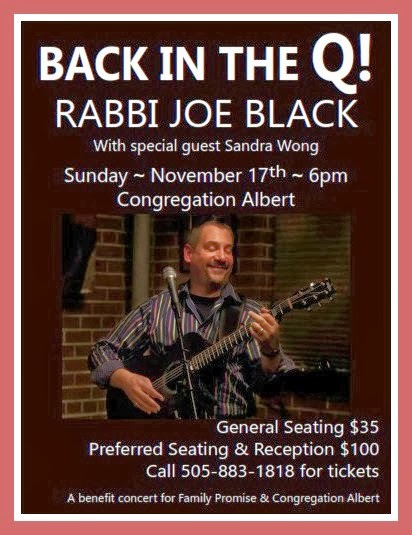 Abq Jew and Rabbi Black have never met, and Abq Jew has never (to date) seen Rabbi Black perform. But we are, of course, Facebook friends. Here is Judah Maccabee, one of the songs that Rabbi Joe Black will undoubtedly perform – we’ll be getting really, really close to Thanksgivukkah. As previously mentioned – this is a benefit concert for Family Promise and Congregation Albert, both good Albuquerque organizations worthy of our support.